Look E-San FC is a football club based in the Bangkok district of Nonthaburi for the 2019 season, who were originally formed as Thai Airways FC in 2002, becoming somewhat of a nomadic club. The team played in the second tier Thailand Division 1 League in 2006, being moved to the A Division of that competition in 2007 playing at King Mongkut's Institute of Technology Ladkrabang Stadium and ending in seventh spot. Division 1 League became one section again in 2008 with the club moving to the Klong Chan Sports Center and finishing eleventh in the table. A move to the Beer Chang Stadium in Chonburi for 2009 saw the campaign end in relegation to the third tier. A return to Bangkok to play at Ramkhamhaeng University Stadium for 2010 in Regional League Division 2 Bangkok Metropolitan Region saw a name change to Look Isan Thai Airways and a ninth place finish. 2011 saw Look Isan depart north of the capital to Valaya Alongkorn Rajabhat University Stadium but the move didn’t bring in much luck, nor did a return to Ramkhamhaeng for the 2012 campaign. A partnership was signed in 2012 to become a feeder club to Police United FC and use their Boonyachinda Stadium home, but the initiative only resulted in a fifteenth place finish. On the road again Isan left for Thammasat Stadium in 2013. The move also led to a change of league as the club were relocated into Regional League Division 2 Central & Eastern Region, which saw Look Isan win the title. However, a poor showing in Group A of the Champions League Round ended any hopes of promotion. Rajpracha Sport Resort was the next location for the club in 2014 as they were renamed Pakchong United FC, where they saw out the season in the lowly reaches of the table and then not competing in 2015. The club returned in 2016 as Look Isan, as Look E-San is sometimes spelt and back in situ at Ramkhamhaeng University Stadium in the third tier Division 2 Bangkok & Eastern Region, finishing in fifth place with Almamy Sylla leading the scoring. 2017 saw a re-organisation of Thai football. Look E-San were placed in the newly created fourth tier Thai League 4 Western Region, ending in a disappointing eighth place despite the goals of Sylla and Supanai Baipa-om. The performance was improved upon by the team coached by Usman Sharif in 2018 as the side reached sixth place, with any hopes of promotion dashed when leading scorer Dennis Borketey was snapped up by Samut Prakan during the season. For 2019 the club moved across town to Nonthaburi and the home of former club BB-CU at Nonthaburi Youth Centre Stadium. A call to take photos at the stadium on a day out in Bangkok. 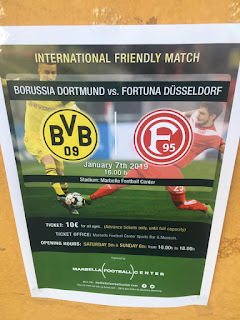 To read all about both visits along with lots of other photos of Nonthaburi Youth Centre Stadium, please click here to be redirected to the BB-CU page. Pattaya Discovery United FC is a football club from the city of Pattaya on the east coast of the Gulf of Thailand that was formed in 2011 as Isan Pattaya. The club competed in amateur football before gaining admission into Thai Division 3 Eastern Region for the 2016 season, which was the fourth tier of the national football system. 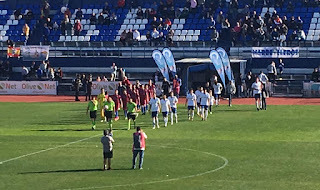 The side ended the season in third position. In 2017 with Pattaya went on to win their divisional title, which was now at the fifth tier with Thawatchai Yokyos, Siripong Meesiri and Kritsada Sansud finishing as joint top scorers. This led to promotion to Thai League 4 Eastern Region. For the 2018 campaign the club changed its name to Isan D'beachaura Pattaya with the team ending up finishing in sixth position with Treepect Kruea-ranya and Chainarong Samuttha banging in the goals under the management of Supat Tongnopakun. The club changed its name once again in readiness for the 2019 season; this time to Pattaya Discovery United FC. My visit to Nong Prue was back in 2013 when Pattaya United FC were tenants and my six a side cricket team, Beer Battered Seadogs had assembled the previous evening for some team bonding on the coast. As is usually the case when I’ve visited Pattaya, I’d drank a lot and got into an argument with one of the sangtheaw drivers trying to exploit me for what should have been a 10BHT (about 25p) fare back from Walking Street. The rain was teeming down so they were wanting 200BHT. Eventually I got back near to the hotel drenched and angry, so rather than continuing I had called it a night. The weather the following morning was beautiful, so after a good breakfast I decided not to waste my time in the resort, and instead head to Nongprue. I really wasn’t sure if I’d ever visit the city again. I’d been to Pattaya numerous times and grown to dislike plenty about it, from some of the grizzled ex pats to the mafia like transport. I’d even gone near to Nongprue several times as I headed out to Horseshoe Point where I’d played and assisted in the running of a couple of six a side cricket tournaments. However, time always beat me popping in and the team always seemed to be playing away when I was there. The taxi driver optimistically asked for an unrealistic price for a return ride. I managed to barter him down to 400BHT return, which was still far too much, but I wanted to get the task out of the way. In fairness it was a lot further than I anticipated as we travelled just as far again on reaching the main Sukhumvit Road. 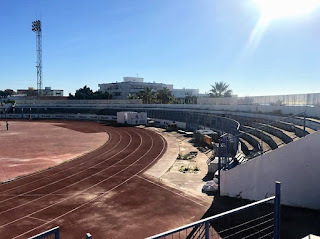 The stadium wasn’t too bad, although there was no spectator accommodation behind either goal; just an area of grass behind the byline and then railed fences. One side had a Main Stand that had the wings added to the original centre section. In common with so many stadiums in Thailand it was raised above the pitch, with tip up seats in the centre section and facilities underneath. Again, typically for the league, the side opposite had a semi-permanent open seating deck built on scaffolding. My driver was a decent chap as things worked out, and he came inside to save me a walk back to the street, before depositing me right outside my hotel in time for me to round up my troops. 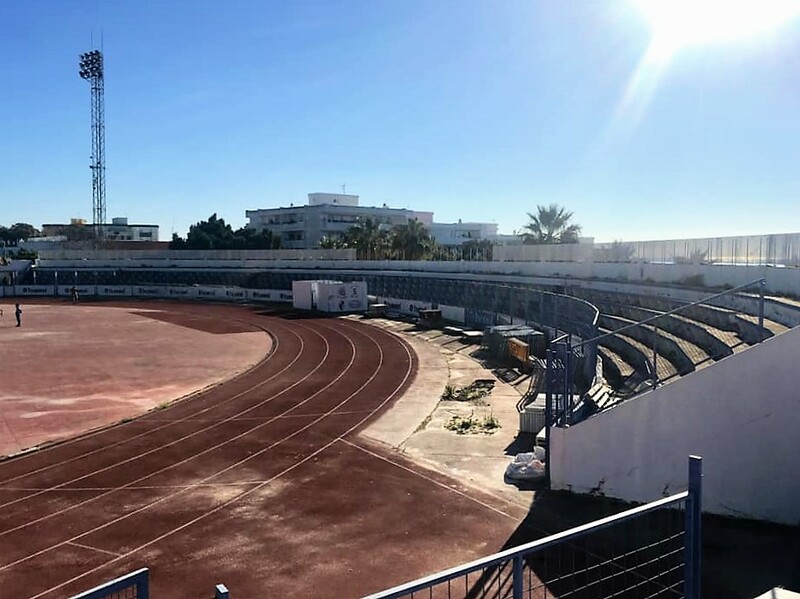 I was interested to hear of Red Bulls investment in the club on my return home and wondered whether the planned stadium would now get the go ahead, and whether I’d muster the enthusiasm to visit if it did. For further photos of Nong Prue, please click here for the Pattaya United page. Canvey Island FC is a non-league football club from the town of the same name located on the north bank of the River Thames in Essex, around thirty miles east of central London. The club was formed in 1926, starting out life in the Southend & District League at their Park Lane home. Much of the club history information was lost during the devastating East Coast floods of 1953 but it is known that they moved on to the Thurrock Combination; going on to complete the league and cup double in 1955-56. Further progression came when ‘The Gulls’ joined the Parthenon League in 1957, where they ended as runners-up in 1959-60. A switch to the London League followed in 1963, before the competition merged with the Aetolian League to become the Greater London League in 1964. The Islanders were placed in the A Division, with Denis Neville, a manager who found success with Sparta Rotterdam and the Dutch national team as well as at Atalanta and Odense Bolkklub at the helm in the 1966-67 season. Canvey won the Division One and League Cup double in 1967-68; a feat that was repeated the following season. The Greater London League merged with the Metropolitan League in 1971 to become the Metropolitan-London League. 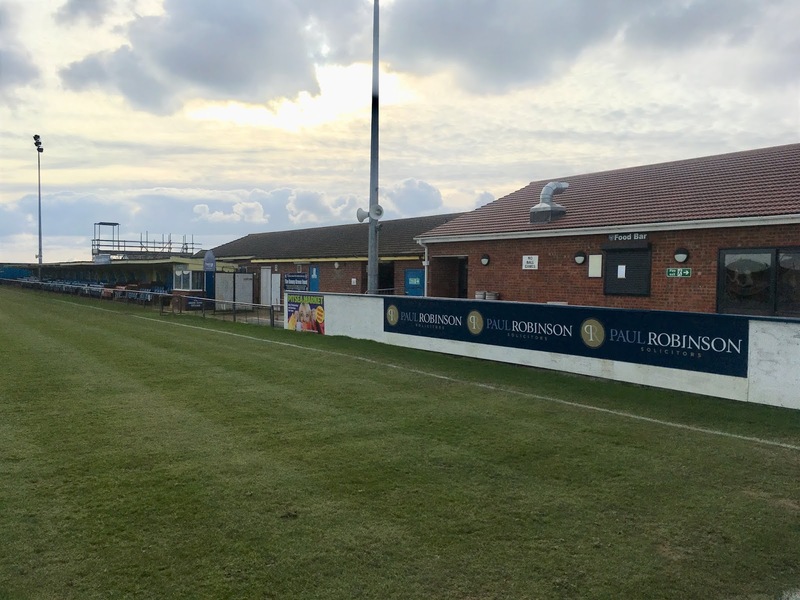 Canvey took up a place in Division One, finishing in the top five for a couple of successive seasons. The league merged with the Spartan League in 1975, at which point the club joined the Essex Senior League finishing as runners-up in 1978-79 and going on to be crowned champions in 1986-87. 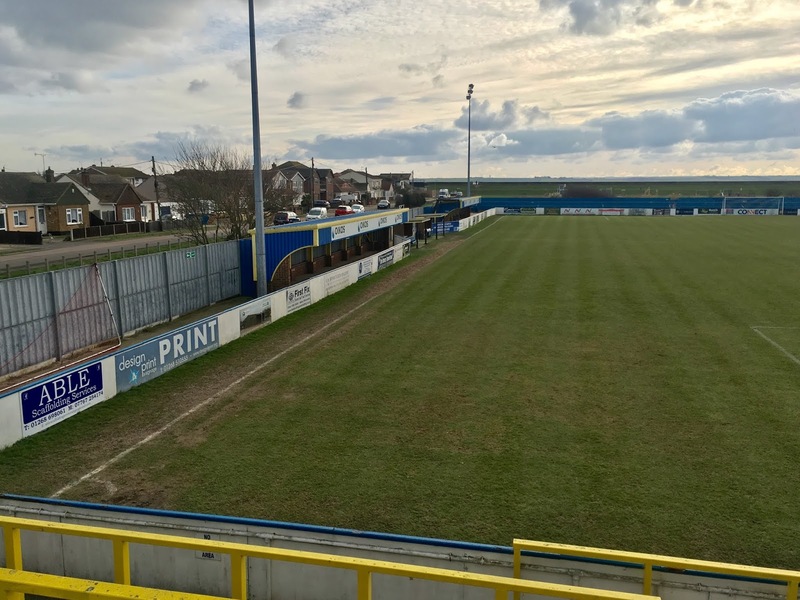 The club was drifting towards possible extinction when former player and local caravan park businessman Jeff King took over the club in 1992, installing himself as manager and pouring investment into the club from his and other businesses. The move paid immediate dividends as the team won a second league title in 1992-93 and going on a tremendous FA Vase run before eventually going out on aggregate in the semi-finals against Tiverton Town. 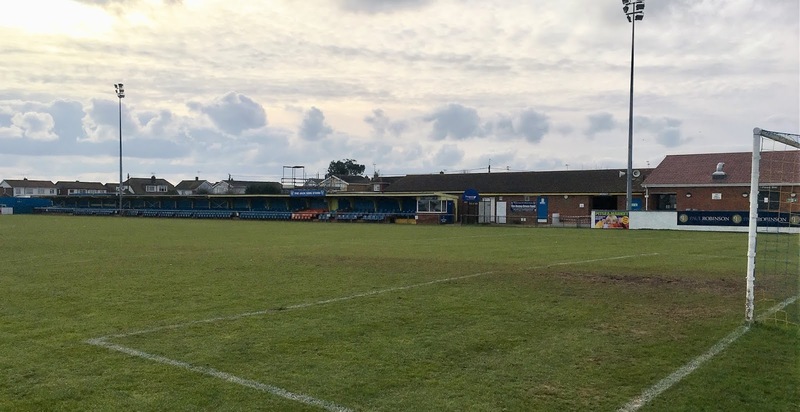 Canvey were promoted to Division Three of the Isthmian League. 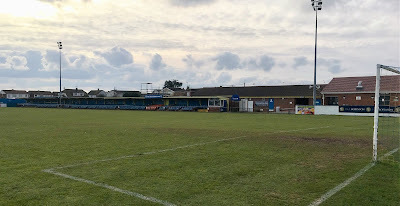 A runners-up place in 1994-95 secured promotion to Division Two from where they won the league title the following season to achieve a rise to Division One. The same campaign saw the side reach round one of the FA Cup before going out to Brighton & Hove Albion after a replay. 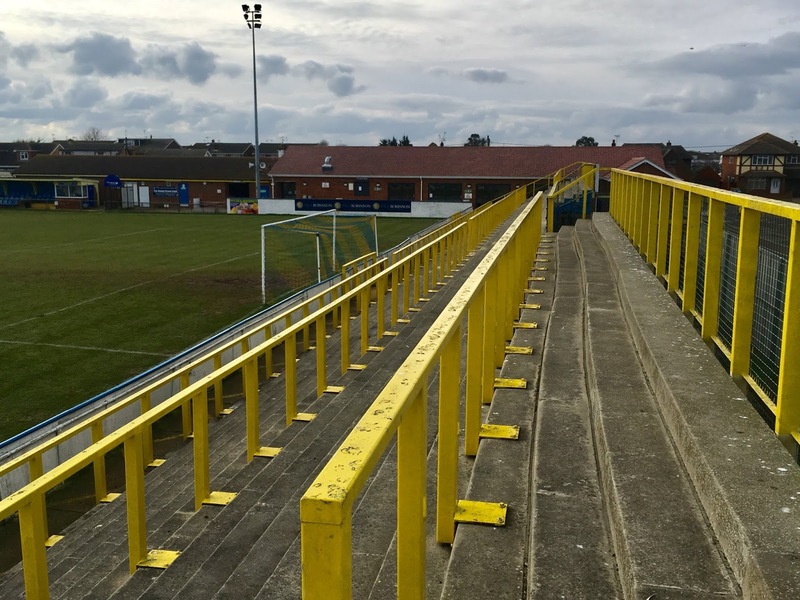 The first game at Park Lane attracted an attendance of 3,400 to see the 2-2 draw, before a slight blip occurred in 1996-97 as Canvey were relegated back to Division Two. King and his team weren’t to be perturbed, winning the Division Two title at the first attempt to return to Division One. The rise continued as the Gulls won Division One twelve months later to reach the Premier Division. The 2000-01 season saw the Islanders finish as league runners-up, but it would be in the cup competitions that the club really excelled. In the FA Cup the side battled through the qualifying rounds to face Port Vale in round one. The sides drew 4-4 at Park Lane before Canvey won the replay 2-1 at Vale Park after extra time thanks to goals from Neil Gregory and Wayne Vaughan. Canvey were drawn at home to neighbours Southend United in the second round. The game was switched to Roots Hall which drew in a crowd of 11,402. Andy Jones bagged a late consolation as Canvey were defeated 2-1. The FA Trophy brought even greater rewards. Wins against the likes of Stevenage Borough and Telford United and then Chester City in the semi-final saw a final appearance against favourites Forest Green Rovers. The final was played at Villa Park in front of 10,007 fans and saw Canvey lift the trophy thanks to a goal from Ben Chenery after fourteen minutes with Mark Stimson, Steve Tilson and Mick Bodley playing starring roles in the success. In 2000-01 Canvey again finished as league runners-up. Their interest in the FA Trophy ended in the fifth round against Yeovil Town, but again it would be the FA Cup that brought the club to national attention. A solitary Gregory goal was enough to win the away first round match against Wigan Athletic. Northampton Town were defeated 1-0 at Park Lane in front of the live BBC TV cameras thanks to another goal from hero Neil Gregor. Lee Boylan’s goal wasn’t enough in the third round at Turf Moor against Burnley who won the tie 4-1. A third successive runners-up Isthmian League Premier Division finish ensued in 2002-03, with the side also reaching the fourth round of the FA Trophy before going out to Northwich Victoria. However the 2003-04 campaign was not to disappoint. 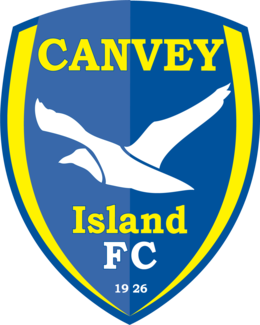 Canvey Island became Isthmian League champions; winning promotion to the Football Conference. The 2003-04 season also saw another FA Cup run to the first round and a rematch with Southend United. 9,234 saw a 1-1 draw at Roots Hall before United won the replay 3-2 at Park Lane. Boyland and Jeff Minton scored the goals for Canvey. The FA Trophy Final was reached for a second time, following wins against the likes of Stalybridge Celtic and Telford United. Canvey went down 3-2 in the Villa Park final against Hednesford Town, with Lee Boylan and Chris Brindley with an own goal netting for the Gulls. Canvey just escaped relegation in their debut Conference season as well as reaching the first round of the FA Cup before losing to Aldershot Town. In 2005-06 the team finished in mid table but King decided that the attendances did not justify the investment. King departed as the club took a voluntary demotion to Division One North of the Isthmian League with John Batch as manager. 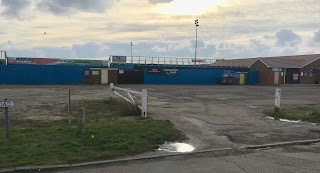 In the 2007-08 season Canvey finished in the play-offs where they defeated AFC Sudbury and then Redbridge on penalties to win promotion to the Premier Division. Glen Alzapiedi took over as manager in January 2012 with Batch moving ‘upstairs’ into a directors role. Former club skipper, Steve Tilson was appointed as team manager in the summer of 2012 before he was replaced by Danny Heale twelve months later. Heale’s side finished towards the lower half of the table before being relegated at the end of the 2016-17. 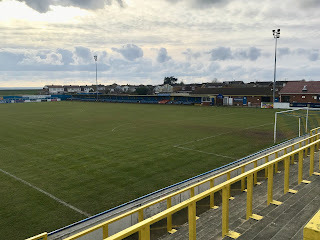 Heale was replaced by Mark Bentley in September 2018 after his side finished in sixth place in Division One North in 2017-18. Canvey Island FC will play in the Isthmian League Division One North in the 2018-19 season. 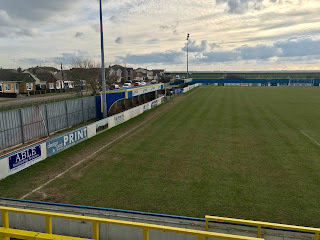 Canvey were just embarking on their most successful spell after being promoted to the Premier Division of the Isthmian League, so I decided that it was about time that I headed east to see what all the fuss was about. The train dropped me at South Benfleet, from where I took a bus onto the island before getting out in the town centre of Furtherwick Road. I was hoping there may have even been somewhere with the FA Trophy on display? Instead I made my way to the waterfront and walked along, before cutting across some fields to the grounds entrance. I forget what the admission charge was, but do recall Hendon having a decent support and the clubhouse being a bit small. 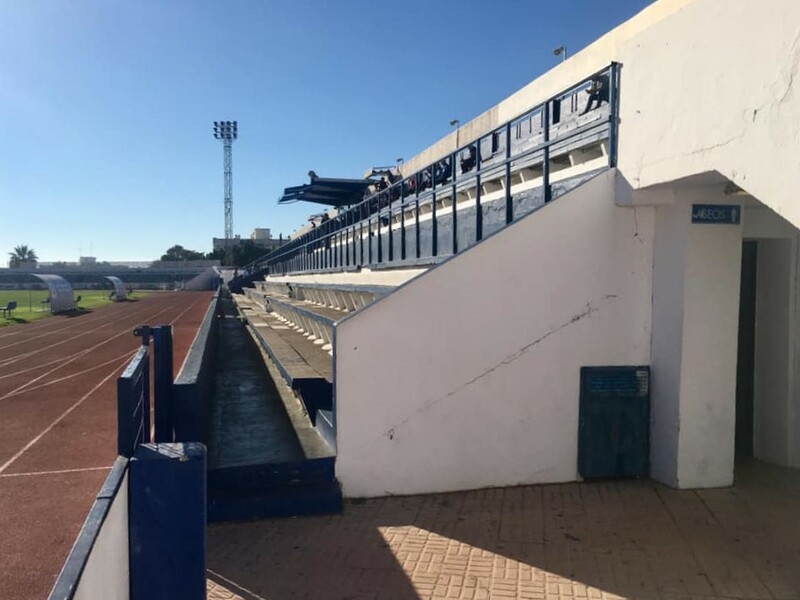 The ground was pretty basic, with a couple of small covers along the very narrow far side and a low Main Stand for seated spectators opposite. The sea end was narrow terracing, with the entrance end having two separate sections of open terrace. Fortunately, Hendon FC have a very good archive, which has assisted my recollection of the game. The visitors gave it a good go in the first half; which ended goalless, before Chris Duffy put the hosts ahead just after the interval. On seventy five minutes substitute Paul Cobb doubled Canvey’s lead as he fired past Dons keeper David Hook. Three minutes later the home side put the game out of reach when Wayne Vaughan broke clear before slotting home. Rene Street headed home a stoppage time consolation for Hendon; which was the least that their efforts deserved against a fast powerful outfit who were obviously heading for greater successes. At full time I ventured over the road to the Admiral Jellicoe pub to await for my bus. The pub was definitely an experience and I wasn’t too upset when it was time to head off. I had an appointment in the West End as I met my friend Liz Robson as we went to the theatre to watch comedian Ed Byrne live. My Mum and Dad were heading to Southampton via London to pick up their cruise ship for a wonderful time at sea around the Mediterranean. It was always great to see them, so I naturally headed to Kings Cross to assist them across the city. We took a cab across town to Waterloo, with Mum being especially impressed at her street wise son telling the driver that he lived in the city; meaning don’t take liberties with the route. With my parents sent on their way on the train I set out to the match. I took my first ever ride on the Waterloo & City line to Bank before heading to Fenchurch Street for the ride to South Benfleet. Time was getting on so I took the bus straight to the ground. I recall some confusion over the entrance ascertaining to whether the game was segregated? Boro fans were given their own little bar at the sea end of the ground complete with TV. I didn’t realise it at the time but I spent time in the company of future touring mates Fred Firman and Tony Rudeforth while our dark humour helped us assess our team’s malaise. It said something about the time that Canvey were looked on as being a really small club in non-league’s elite league. Boro fans should have been used to disappointment with all the mismanagement at the club, but there was something bad really setting in. It really did feel like the beginning of the end to me. The promised security from the Chelsea FA Cup money was looking like pie in the sky and the form on the pitch wasn’t any more re-assuring. Nick Henry had been replaced by Neil Redfearn and the authorities were looking to nail the club. It was no surprise when Canvey took the lead in the seventeenth minute as John Kennedy slotted home. Boro looked clueless as Mitch Cook shouted out from the bench as Redfearn did his best on the pitch, with what in reflection wasn’t a bad set of players. Dominic Sterling had a header over the top and then an effort saved by Leigh Walker as Canvey looked to double their lead. Redfearn had Boro’s best opportunity, but fired his shot well over the bar before he was replaced by local youngster Michael Coulson. 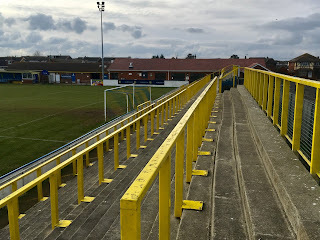 Park Lane had been improved with the earlier mentioned provisions for segregation and extra away fans facilities, along with a brand new open terracing at the entrance end of the ground; which stretched the full length behind the goal. 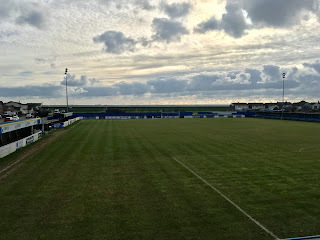 I headed back to London as depressed as been a Scarborough fan as I could ever remember before or indeed since; and that included the time the club folded. Indeed, Fred and I often point to this visit as the nadir in Boro’s history. With a day free from work I headed along the banks of the Thames back to Canvey. I’d got lost in looking for the home of Concord Rangers before taking a bus towards the town centre and then following my previous footsteps along the waterfront to Park Lane. The ground was locked but I managed to take some photos for my collection through the gaps in the fencing. Unfortunately my work would later be in vain as I lost lots of photos with issues to my laptop. It was still a good day out as I clocked up the miles walking in a nice environment and then heading on to Southend for a look at Roots Hall and the Southchurch Park home of Southend Manor as well as enjoying a couple of beers before the train home. I'd wanted to replace my lost photos for quite some time, so I decided to spring into action with the day off work. It was bright and bitterly cold as I headed on the usual train and bus route, which dropped me by the Park Lane ground. The gates were locked, but the clubhouse was open. I half shocked a poor lady stocking the bar to death. Fortunately, she was friendly and welcomed me to go through the door out into the ground to snap away. The cold had frozen a part of the terrace, which went unnoticed to me until I nearly had a bad accident on it. Not to be put off, I did a lap of the smart arena before thanking my kind host and heading off for a good stretch. It was the opening day of the Second Test between the West Indies and England so I listened as I walked along the path by the sea wall. I was in good form and enthused by the friendliness of other locals who acknowledged each other as they passed. The overtures of the Windjammer and Haystack pubs were tempting, especially with cricket on, but I had an evening appointment with ale awaiting me. Instead I sat out of the wind and enjoyed excellent battered sausage and chips from Islanders on Furtherwick Road. The 21 bus took me back to Benfleet station from where I had a pint and watched a bit of the Test in Windsor Fenchurch and then a good walk through the city, appreciating some of the stunning buildings including the always beautiful St Paul's Cathedral. Jeff Cards was meeting me at Temple Brew House. My mate had come up trumps. It brew its own good ale at a fair price, showed the cricket and had friendly service. We also took in fine beers at the Nell Gwynne Tavern and The Harp before Jeff had a bit of a shock. He agreed to watch a bit more cricket with me and was adamant that the Empire Casino had a dedicated sports bar. It did indeed, and they put the match on a huge screen, but it was my pals shout. It was £6 for San Miguel, the best option on offer. We didn't spill any! 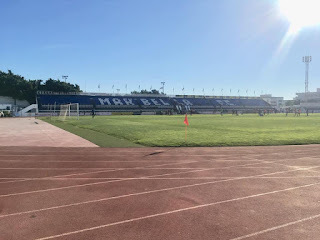 Marbella Fútbol Club is a semi-professional football club from the coastal city of the same name in the Spanish region of Andalusia that was formed in 1997, originally as Unión Deportiva (UD) Marbella. 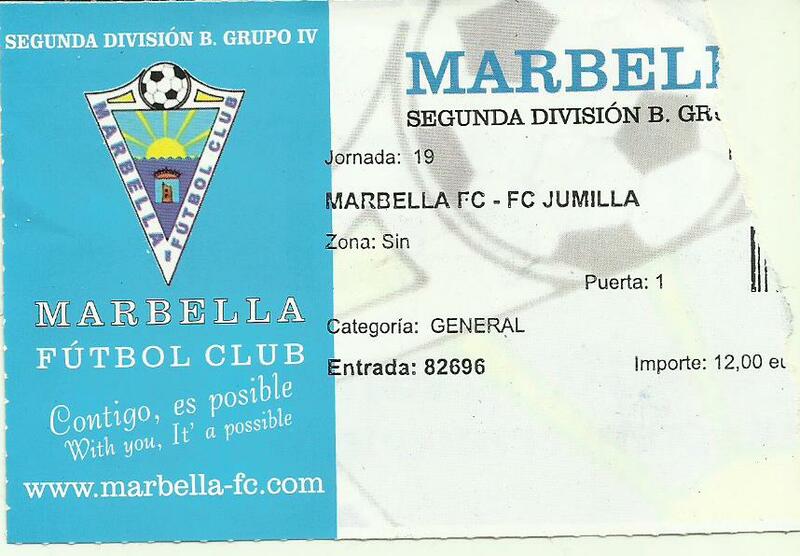 However, UD Marbella were not the first senior club to represent the city. 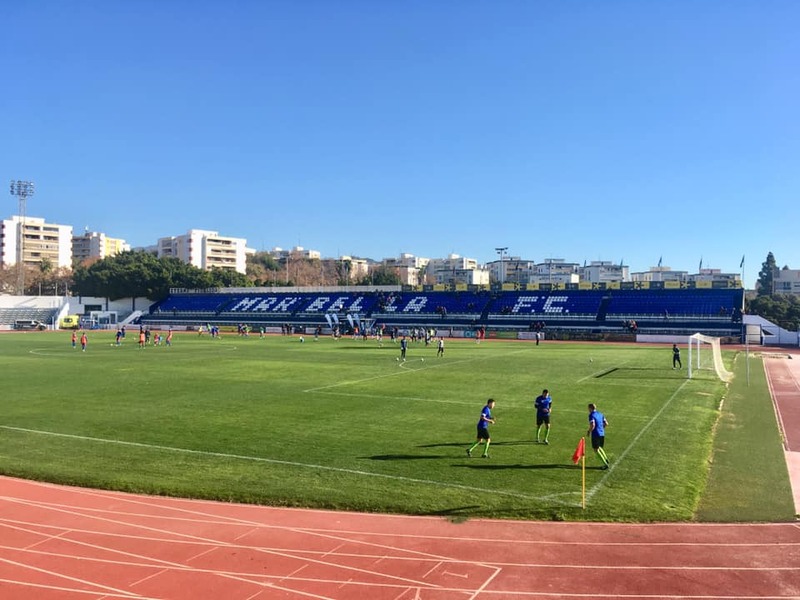 Club Atlético Marbella, who for a time were the reserved side for CD Málaga, had been formed in 1947 before becoming defunct fifty years later. 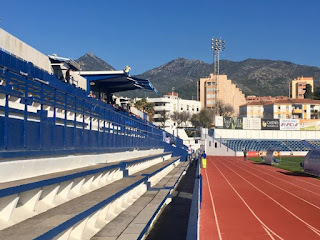 Club Atlético started out life in regional football where they remained until the end of the 1963-64 season before winning promotion to the then third tier Tercera División while playing at Estadio Municipal de Marbella. Locally born businessman and future mayor of Marbella Jesús Gil took over the club around the time that Atlético went back down to the fourth level Preferente Andaluza. The team returned to the Tercera División following promotion in 1972-73. Atlético were relegated again in 1975-76 but returned twelve months later. 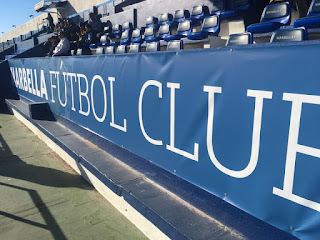 This time their Tercera División lasted two seasons before a further demotion. 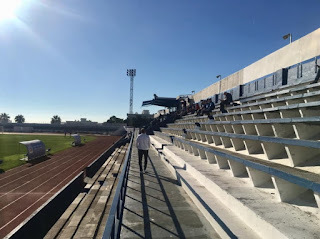 The Tercera División became the fourth tier following league reorganisation in 1977-78 with the club being placed in it. Another relegation hit Atlético after just a season before they returned to the fourth level at the end of the 1979-80 campaign. This time the club consolidated and then improved to finish second of Grupo IX in 1983-84 before winning promotion to Segunda División B through the play-offs. However, their third tier spell lasted just a season before they dropped back down. 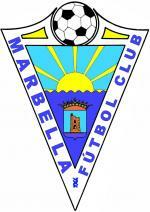 It didn’t stop Marbella for long, who regained their position after another triumphant play-off campaign in 1986-87. Three seasons of Segunda División B football were played in Grupo IV with Juan Tapia in fine form in goal before his successor Francisco Leal also performed admirably but couldn’t save his side from relegation in 1989-90. 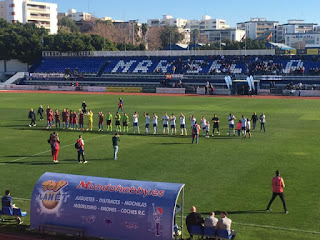 Marbella bounced straight back to win their Tercera División title at the first attempt to return to the third tier where the goals of Manuel Sousa and keeping of Francisco Leal saw Atlético win the Grupo IV title before finishing top of Grupo D in the play-offs to win promotion to the second tier of Spanish football. A seventh place and then two mid-table finishes were achieved before Gil sold the club to concentrate on matters at Atlético Madrid to Slobodan "Boban" Petrović, an entrepreneur from Serbia. 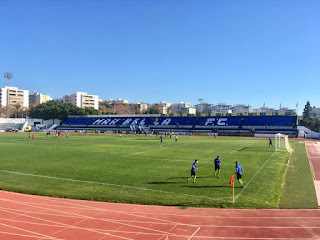 Atlético Marbella finished bottom of the Segunda División in 1995-96 and then bottom of Segunda División in 1996-97 before they were dissolved. 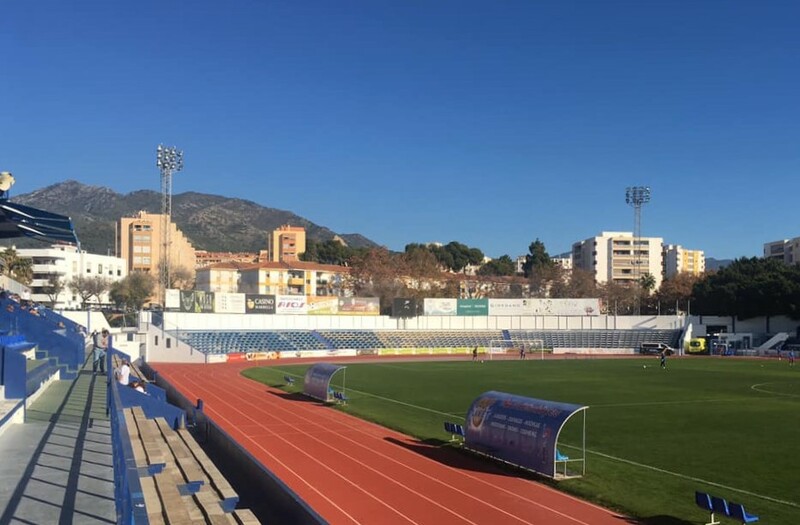 Unión Deportiva Marbella took up a position in the fifth tier Primera Andaluza, which they won at the first attempt in 1997-98 to win promotion to Tercera División. UD lifted the Grupo IX title in 2000-01 but missed out on promotion in the play-offs. However, a runners-up berth in 2002-03 led to a successful play-off campaign and promotion to Segunda División B. 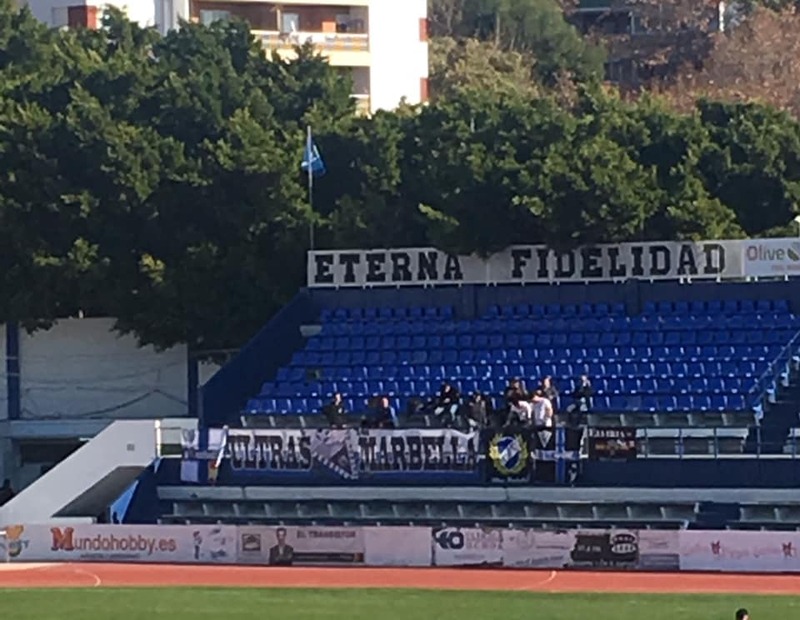 After just avoiding relegation, Marbella finished fifth in Grupo IV in 2004-05 before just doing enough to stay up in 2007-08 with Alejandro Ávila in goal. Fourth place in 2008-09 with striker Tommy Mooney in the ranks was followed by relegation in 2009-10. 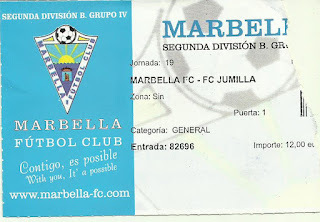 Marbella reached the Tercera División play-offs in 2011-12 after a third place in Grupo IX. 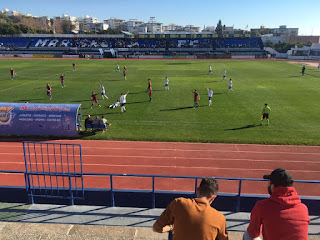 CD Mairena were overcome before Real Madrid C ended any hopes of promotion. A mid-table ending was followed by a title winning campaign in 2013-14 with Javier Añón banging in the goals. CD Eldense were defeated after extra time in the play-off with 5,200 fans attending the home leg with the goals coming from Airam, Pibe and Añón to regain their Segunda División B status. 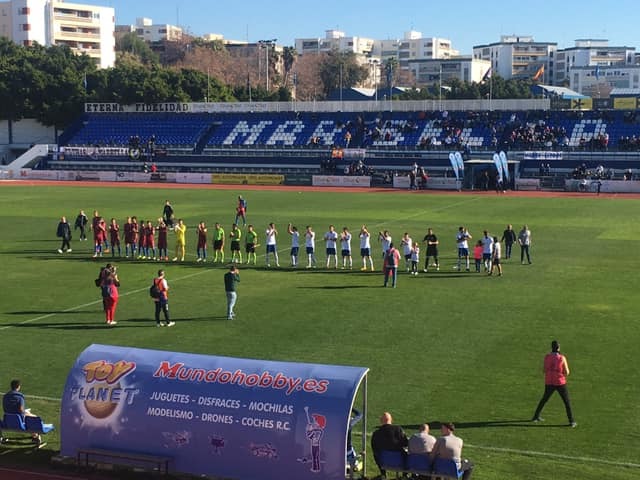 Marbella ended in tenth place in 2014-15, fourteenth in 2015-16 and then seventh in 2016-17. The goalkeeping of Wilfred Muñoz played its part in his side finishing as Grupo IV runners-up in 2017-18. 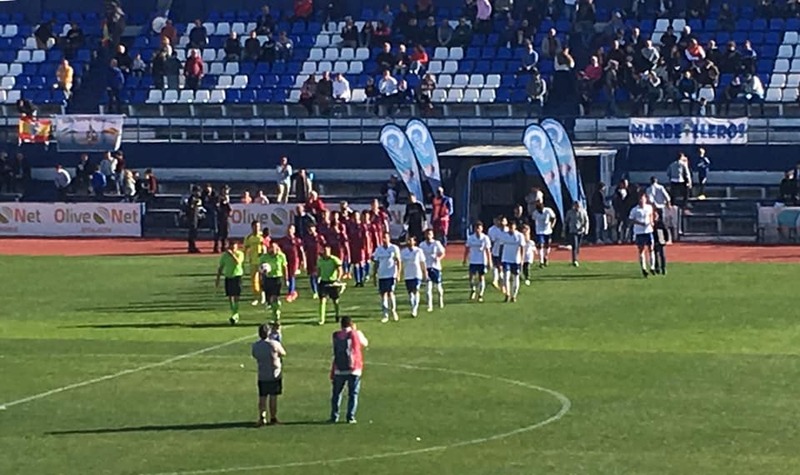 Celta de Vigo B were to beat Marbella on penalties in the play-offs. Marbella FC will play in Segunda División B in the 2018-19 season. It was the second day of my trip to Andalusia and it was the Epiphany Bank Holiday, this meaning an excellent chance of seeing some football when there wasn’t much on elsewhere. My weeks holiday from work fitted in perfectly! 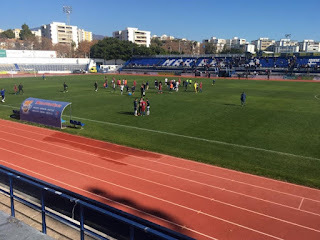 I’d been to see the capitulation of Málaga CF against CF Reus the previous evening and awoke in good fettle; cheered further by the beautiful blue skies as I took the number 1 bus from Plaza de la Merced to Estación de Málaga María Zambrano after nearly catching it in the wrong direction; an error I also nearly made from the airport on my arrival. This was an impressive modern railway station, but the shops were still to wake up. 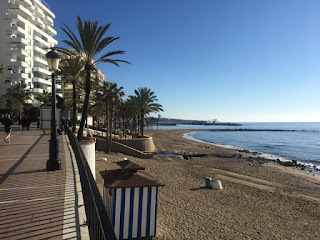 I made my way through the mall and across the road to Estación de Autobuses de Málaga to try and find a bus to take me down the coast, as trains did not go the whole way. 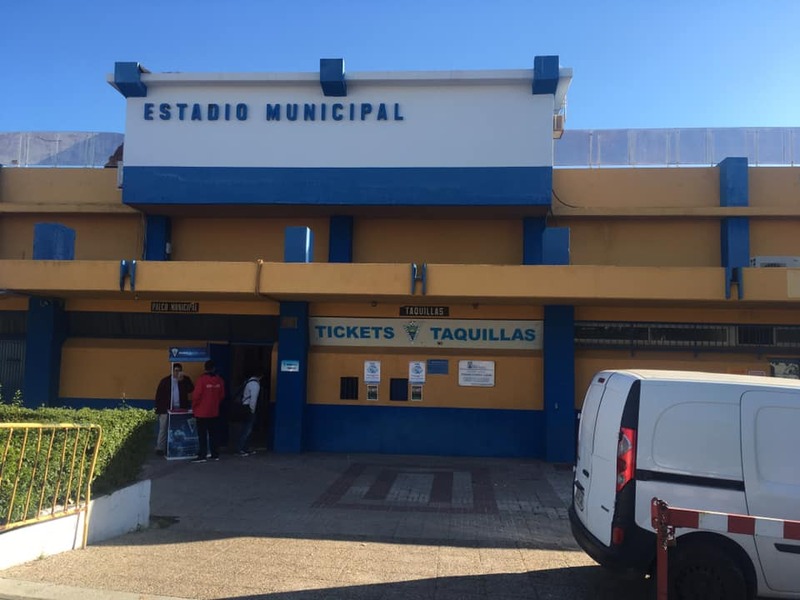 My Spanish is basic, but with smiles and a few please and thank you and an attempt to say Marbella with the correct pronunciation, I was directed to the correct ticket counter, where a jolly vendor sold me a single ticket for €8.50 and told me which bay to head for. The journey departed at 9.15am on a spacious modern coach. 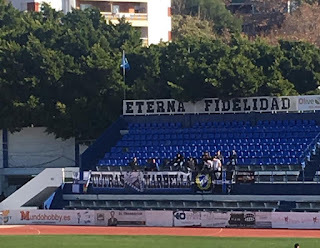 The free Sur local newspapers on the dashboard proclaimed the headline; “Lamentable” with a picture of a couple of Málaga players. The marks out of ten for each player left no doubt as to the reaction to the display. Our route went via the airport, where it filled up. English voices were prominent for the rest of the ride, which took around eighty minutes to our destination. 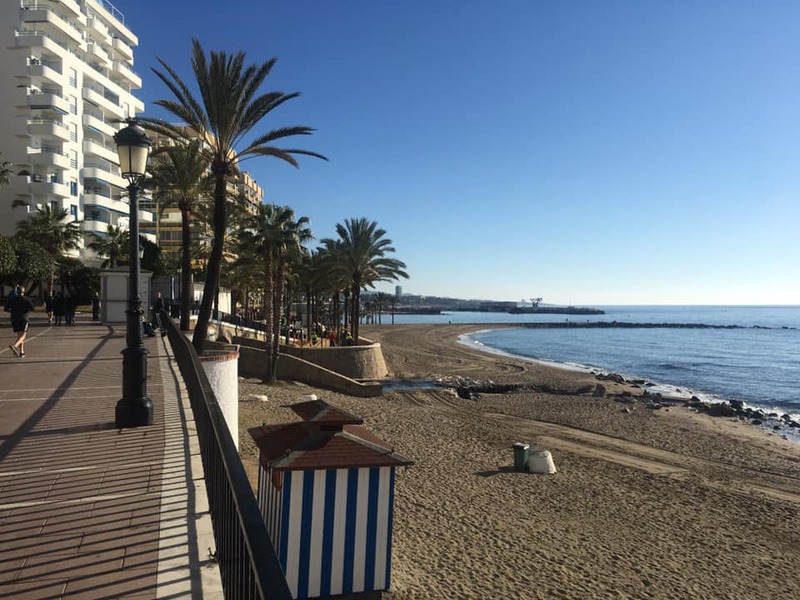 I was off and away, keen to have a good walk and see what Marbella had to offer. The old town was very pretty. More undulating than Málaga but not as commercial, or it didn’t seem to be at that time of the morning. I reached the sea front and had a good walk to take a look at the marina and stretch along the promenade. The sun was warming everyone up on a stunning morning. Although I was unable to access the internet on my IPhone I had a good idea of where I was heading. I cut up from the sea front to the main N-340 before walking up the slope of Calle Serenata in the direction of Estadio Municipal. 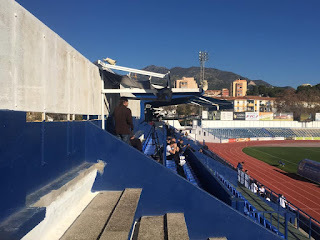 My ticket cost €12 from a booth built into the back of the stand. 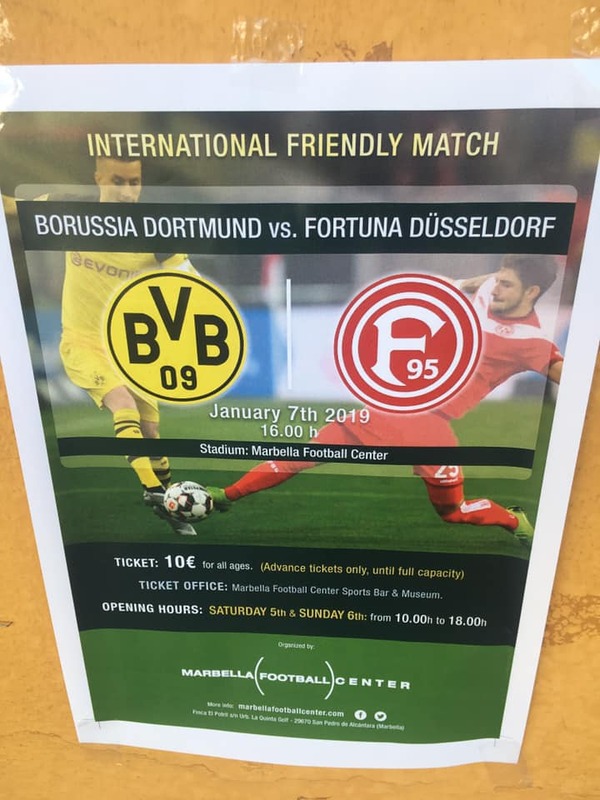 A poster was on display for a friendly at 4pm between Borussia Dortmund and Fortuna Düsseldorf, which I presumed was at the same venue? Both clubs, along with some other German and Dutch sides were taking advantage of their winter breaks to enjoy some warm weather training and practice. 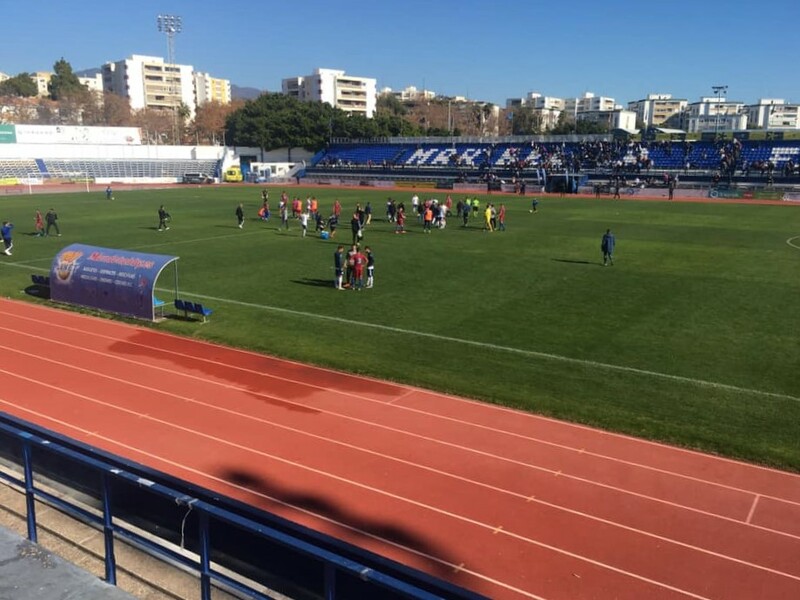 It turned out the game was at Marbellla Football Center; several miles away. It’s as well I didn’t hang around for it! 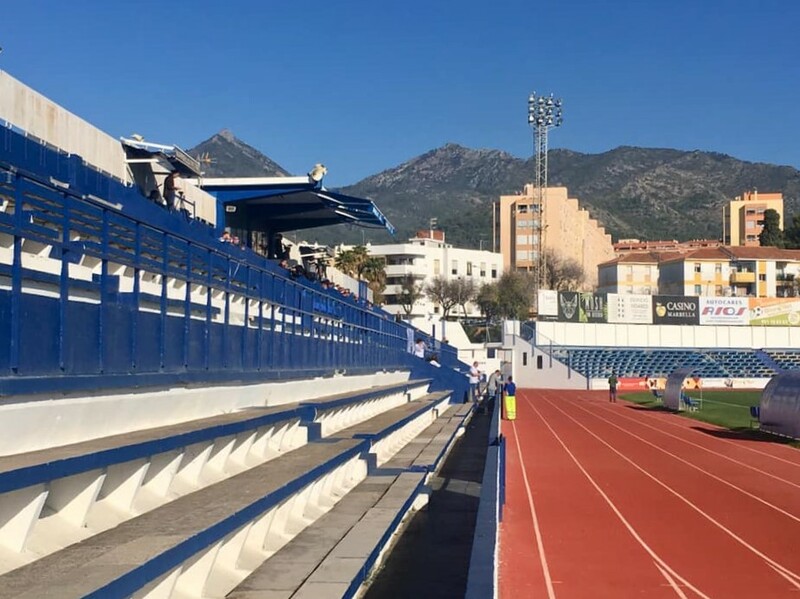 Estadio Municipal de Marbella was a tidy enough venue. Both sides had raised pitch length sections of raised steps, which doubled up as seating. The side where I was had a covered middle section and some proper seating. The players tunnel was opposite. 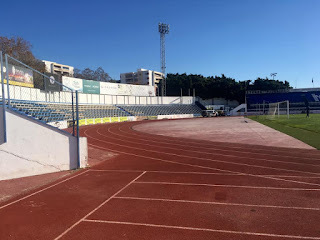 The ends were curved as the pitch was surrounded by a running track. Both had open steps, with the north end slightly larger. Some stunning mountain scenery was in the background, while the ocean could be seen beyond the other end. It was a lovely place to be on a January Monday morning as temperatures were touching 20°. I’d taken up a spot on the back row next to the posh seating when a fella started speaking to me in Spanish. He realised that I was a visitor and then explained he was filming the game for the club and needed to be sat in my place. This was no problem. He was a friendly chap who gave me a bottle of water and chatted about my trip. 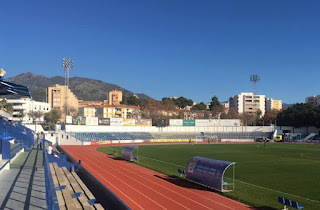 He explained that the away side Jumilla had a connection with Wolverhampton Wanderers, who had loaned the team six of their players to progress before hopefully making the first team at Molineux. The game kicked off at 11.30am and within seven minutes, Ryan Leak, the Welsh born full back on loan from Wolves had received a yellow card. Wilfred in the Marbella goal saved a shot from outside the box with comfort four minutes later from Oscar Rico. Alvaro Montero had a header off target for the hosts as the game saw few chances. Montero spurned a half chance as half time approached, but there was still time for Jumilla to take the lead just before the interval. Mustafa made a poor error for Marbella with a misplaced pass that was pounced on by the man of the match Ming-yang Yang who crossed hard and low for Oscar Rico, who did well to finish through a congested area. The referee blew his whistle soon after. Facilities for refreshments were basic so I gave it a miss, figuring that I’d grab something before heading back to Málaga. A posse of ‘Blanquillos’ sat near me had a beer but I wasn’t really in the mood. I was happy just to sit back and relax. The goalscorer turned provider on fifty-three minutes when Rico picked up the ball from Yang to put over a delicious cross from the left flank. Peque rose above Wilfred to head home at the near post unchallenged. Montero was giving it everything for the hosts, who improved following a couple of substitutions made by head coach David Cubillo. Mustafa came close to making atone for his earlier header but was crowded out following a good run. Montero had a headed goal ruled out with just less than twenty minutes remaining on the clock as the ball had gone out of play before the cross came in. The excellent Yang took a well deserved break with fifteen minutes remaining. His replacement Boubacar Hanne was soon to make his mark when he scored with a superb twenty five yard powerful dipping effort that left Wilfred flapping at fresh air. At the other end Simón made a fine stop to keep out Manu Molina. Substitute Sillero was foiled by Simón shortly after. 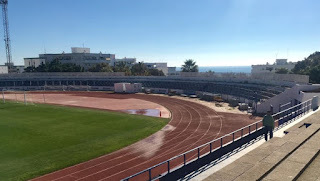 I said goodbye to my friend and made my way back out at the top end of the stadium before taking the twenty minute walk with some good hill work in the shadow of some beautiful scenery. That said, I wasn’t upset when I got near the bus station. I’d got a bit of a run on as I thought I may make a bus that seemed to have Málaga on the destination board. The queue at the ticket office window was moving agonisingly slowly. There was no need to worry as an express service was leaving at 2.15. There was time to grab some refreshments from the machines before relaxing to the superb Music Complete New Order album on my IPod and drift off. Before I knew it we were back in Málaga and I went round the corner to catch the bus back to by room. I’d enjoyed Marbella, the football and the city. Now it was time for a quick siesta before heading to my evening match three miles along the coast at El Palo.